Includes Planning a classic Scottish wedding? 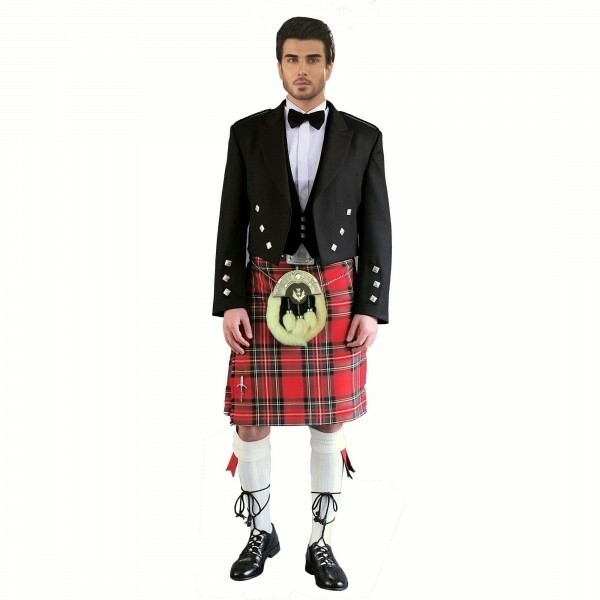 The Kilt Outfit makes it easy to purchase the outfit for the groom as well as for the groomsmen as needed. We’ve simplified purchasing Scottish wedding attire with this all-in-one set. You’ll receive a made-to-measure dress kilt in the tartan plaid of your choosing for that authentic Celtic look. The set also includes a classic Prince Charlie jacket with hardware to match, a formal white shirt and a bow tie. Complete the outfit with the sporran, belt buckle, belt and kilt pin that you prefer, and we’ll throw in the kilt hose, flashes, and ghillie brogues.